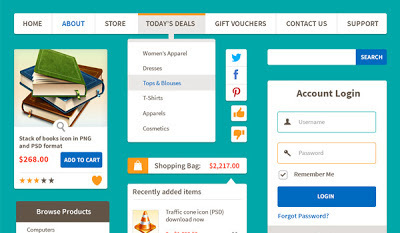 Friends, today we accompany you PSD ecommerce UI kit with flat design style ability in volume-1. The kit contains adapted UI elements such as menu bar with dropdown, product widget, shopping cart dropdown, account login, product categories widget, tabbed box, banner etc., for use in ecommerce projects. The elements are created in Photoshop with shape layers, and you have all the achievability to edit and resize them according to your needs. Well, added UI elements in volume-2 will be arise soon, so stay tuned!